In May, 1980, Mount St. Helens, dormant for eons, blew sky high. 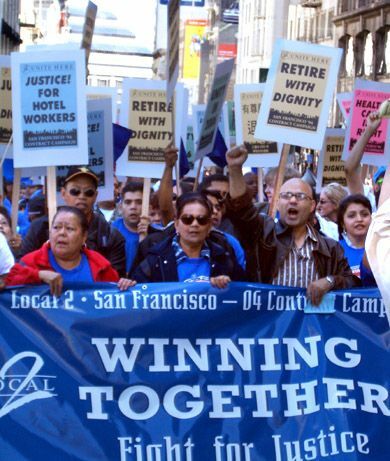 In July of that same year, six thousand San Francisco hotel workers began a month-long strike, the first citywide San Francisco hotel strike since World War II. Today, Mount St. Helens is rumbling again, and San Francisco hotel workers are back on the streets in the first citywide hotel strike since 1980. On Wednesday, September 29, 1,400 workers struck at four hotels -- the Hilton (San Francisco's largest hotel), the Mark Hopkins on Snob Hill, the Argent near the convention center, and the Crowne Plaza near Union Square. Guests are leaving these hotels in droves. The Hilton has canceled a set of events for the Charles Schwab company, as has the Crowne Plaza for the U.S. Treasury Department. Guests trying to check in are being met with chants of "Shame on You!" And, despite the corporate media spin, you can bet they are dealing with plenty of dirty sheets, dirty toilets and shuttered restaurants. The conditions hotel workers are fighting are much the same as those facing working people everywhere these days. The bosses are trying to dump medical costs on their employees. They are acting like decent pension plans are only for corporate executives. They are offering insultingly-small wage increases. All this on top of the fact that the workload on hotel workers has increased dramatically in the aftermath of 9/11, which hit the San Francisco travel industry very hard, resulting in mass layoffs. San Francisco hotel workers are very predominantly people of color, many of whom are immigrants. Although Local 2 has one of the best hotel contracts in the country, most hotel workers know all too well what it is like to live from paycheck to paycheck. After months of inconclusive negotiations with hotel owners, UNITE HERE Local 2 has called a two-week strike at the four hotels. The union leadership calls this a "measured" response to the bosses' intransigence, in essence a warning shot across their bow. In 1980, the union struck 12 hotels. The hotel bosses responded immediately with a lockout at 24 more hotels, creating a major labor crisis that rocked the city for the next month. Today, the big hotel owners have again threatened a lockout, but, as of this writing (Thursday, noon) they have yet to pull that trigger. It is difficult, nonetheless, to imagine that the deep divide between the hotel bosses' greed and the hotel workers' need is going to be resolved with a two-week strike at four hotels. Your reporter is himself a hotel worker, having worked in the culinary/restaurant/hotel trade for four decades. I am proud to have been a member of Local 2 for nearly three of those decades. So please forgive any subjectivity in the following comments. The labor movement is at a crossroads. On the run for decades, we have staggered from crisis to crisis. The 1980 San Francisco hotel strike was one of the last big strikes before the onset of the Reagan era and the reactionary political trend it represented. Those politics have been most unkind to working people, and have led us, although not in a straight line, to the neo-fascism embodied today in the Bush regime. The most recent debacle for the labor movement, the five-month long strike by Southern California grocery workers, which ended in a horrendous defeat, demonstrates just how high the stakes have gotten. San Francisco hotel workers now find ourselves, whether by choice or not, on the front line of the struggle for the dignity of labor. While we walk the line at the Hilton, the Mark Hopkins, the Argent and the Crowne Plaza, thousands of unionized hotel workers in Los Angeles and Washington D.C. are struggling with their bosses and working without contracts. Northern California grocery workers are also in very difficult negotiations. Meanwhile, political life in the US is dominated by Bush's so-called "war on terror." Yet, in the words of South African President Thabo Mbeki, the "rich fight terrorism, but the poor fight poverty." Some believe that turning out King George in November and replacing him with the man from Massachusetts will fundamentally alter the fortunes of the labor movement. I am not among those hopeful souls, as much as I would like to see the tweedledum from Texas get his comeuppance. It's trite, but true -- the key to victory is solidarity, solidarity, solidarity. We need the active support of our working class brothers and sisters in San Francisco and beyond, and the support of all progressive-minded people. And you need us to come out of this struggle with our heads held high, or you are next. The labor movement is like the lava flowing below a volcano. It boils unceasingly, but usually out of sight and out of mind. Today, the hotel strike is bringing the labor struggle to the surface. At such times, it can sometimes move mountains. See ya on the picket line.